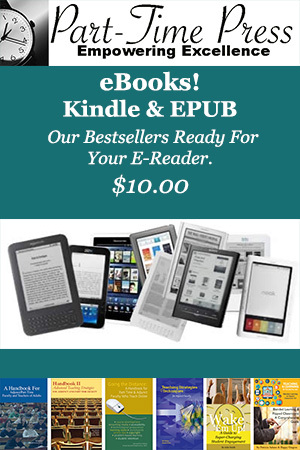 California State Senate Bill 1379. Where do I even begin? SB-1379 was sold to California adjunct faculty as the so-called Part-Time Faculty Job Security Bill. How, then, does the proposed law encourage or strengthen the stability of the state’s part-time professorate or provide job security? In point of fact, it doesn’t. The text of the legislation (which was forwarded to Gov. Jerry Brown for his signature at 3:30 p.m. on Sept. 9, 2016) is uncomplicated. It builds on several disadvantageous laws that shortchange that state’s faculty who are hired to teach less than full-time course loads (67 percent or less of a full-time course load to be precise). Existing California law requires “that a person employed to teach adult or community college classes for not more than 67 percent of the hours per week of a full-time employee having comparable duties, excluding substitute service, be classified as a temporary employee and not a contract employee.” This change in the state’s law was the doing of the California Federation of Teachers, and it raised the bar necessary for non-tenured faculty to quality for the same pay and benefits offered to full-time faculty. In short, California’s state’s AFT affiliate chose to push employment and pay equity further out of reach for adjunct faculty members rather than call for equity in pay and employment to be implemented at, say, 51 percent of the hours per week of a full-time employee. 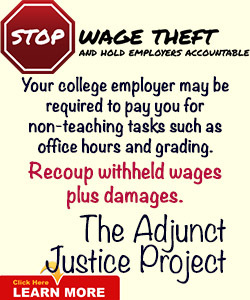 Adjunct faculty do need job security and pay equity. This boondoggle, however, doesn’t provide either. 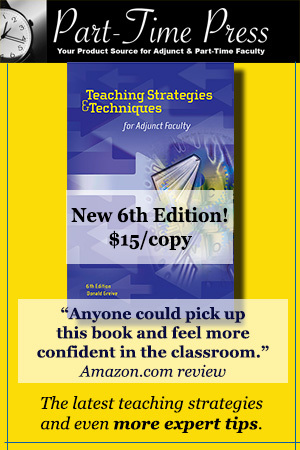 It is cost-effective to keep the same part-time/adjunct faculty semester after semester. Student success relies on stable faculty. There should be equity for all faculty. 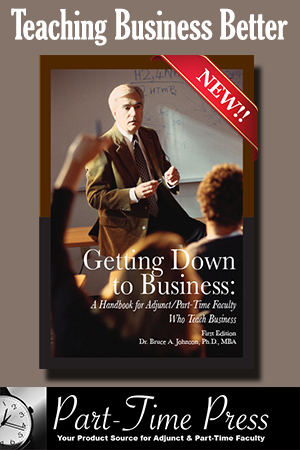 Part-Time/Adjunct job security is a cost effective means of assuring student success. However, there is nothing in the legislation that guarantees adjunct faculty job security or due process. In fact, the Bill clearly states the opposite, that “no part-time faculty member shall have reasonable assurance of continued employment at any point, irrespective of the status, length of service, or reemployment preference of that part-time, temporary faculty member.” In other words, should this Bill become law, adjunct faculty can be refused continued employment without explanation, because no part-time faculty member will ever be guaranteed reasonable assurance of continued employment. Union negotiators who attempted to bargain contracts which provide any assurance of continued employment for part-time faculty would, then, be thwarted by the the language of SB-1379. So if California adjuncts aren’t getting job security or due process, if their students aren’t being provided a stable part-time professorate who has job security, who’s benefitting? Sounds great, right? Well, what if the college where the part-time, temporary faculty are employed already has a union local for the full-time faculty controlled by those same full-time faculty? Will that union local automatically become the “exclusive representatives” for its college’s part-time faculty? Such unified locals have been harshly criticized by adjunct activists as routinely providing grossly unequal representation of full-time and part-time union members. This and other events suggest that full-time faculty union locals and their members simply can’t be trusted to bargain on behalf of or represent the best interests of part-time faculty members. A little more than a decade ago, we saw thievery when the state of California allocated almost $60 million for adjunct faculty equity pay between 2001 and 2004, and many millions went to union locals controlled by full-time faculty who then doled out the money to themselves and their full-time faculty union members. According to research, student success is most positively impacted by an institution’s facilities, helping first-year students make meaningful connections on campus, academic engagement and socio-economic indicators. The “length of time a part-time, temporary faculty member has served at the community college or district” or the “number of courses part-time temporary faculty have taught” benefits the faculty member and the education unions’ blind reliance on seniority rather than merit (evaluations). In fact, under the auspices of SB-1379, evaluations can only be used to penalize adjunct faculty (terminate their teaching appointments) and not to reward them. This is not only a disincentive for the faculty members, it’s terrible for the students. It’s common knowledge that length of time in the classroom doesn’t automatically improve the quality of instruction provided. The icing on the cake? John Martin, Chair of the California Part-Time Faculty Association (CPFA) penned a letter to Gov. Jerry Brown on Sept. 8, 2016 on behalf of the CPFA’s 46,000 members in which Martin writes, “SB 1379 has a straightforward goal: to mandate California’s community college districts to negotiate a baseline set of ‘reemployment preference’ rights and retention practices for part-time faculty across the state.” Martin goes on to claim, “More significantly, SB 1379 would make tremendous strides in boosting student success. By ensuring continuity and stability of faculty work assignments, SB 1379 means critical support and resources for students, support which is otherwise virtually non-existent. SB 1379 thus links directly to California’s future through the success of tens of thousands of California’s community college students.” I have to wonder if John Martin read and understood the final sentence of the one-page bill. SB-1379 passed the California State Senate by a single vote. We can only hope for the sake of the state’s tens of thousands of part-time faculty that Gov. Brown can read and comprehend plain English better than the advocates of this flawed legislation who are brazenly misleading trusting adjuncts and their students. Thanks for this. Sounds like there are some flaws here but I wonder if this language in the last sentence might be designed to allow adjuncts to still apply for unemployment insurance between terms or academic years. To get benefits you cannot have “reasonable assurance” of future employment. I believe Sami is correct in that this no reasonable assurance language will allow adjuncts continuing access to UI benefits under the current law. But, I believe it’s real motivation is to allow, for example, adjuncts to not be rehired when the classes they teach become otherwise unavailable. The State has an unfunded mandate to increase the number of full-time faculty to 75% of the professors, but doing that would, of course, mean a loss of adjunct positions. What is needed is the funding of that mandate together with a conversion of existing adjuncts into full-time possitions–not just a conversion of positions that do not carry the people along with them!